1) Marinate fish slices with salt and tumeric powder. 2) Fry fish in oil until cooked and lightly golden on both sides. Remove to a side plate. 3) Heat 2 tablespoons oil, saute garlic and onions until fragrant. Add in sauce ingredients mixture and cook it for 1 minute or until mixture slightly thickens. 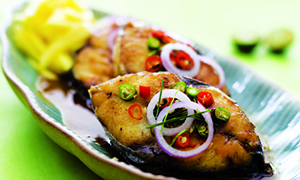 4) Pour sauce mixture over fried fish and spoon shredded mango, kaffir lime leaves, bird's eye chilies over it.